Newcomers to singing might not even understand what “harmony singing” is. In which case you might like to read What is harmony singing? first. But even when you know what harmony singing is, how do you work out which of the various parts you belong to? 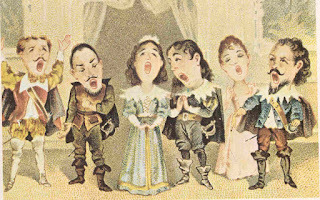 Before the Italians brought terms like soprano and tenor to our shores, most harmony singing consisted of men and women singing together in each of the different parts (high, medium and low). But now we tend to separate the men’s and women’s voices in order to cover a much wider range of notes. 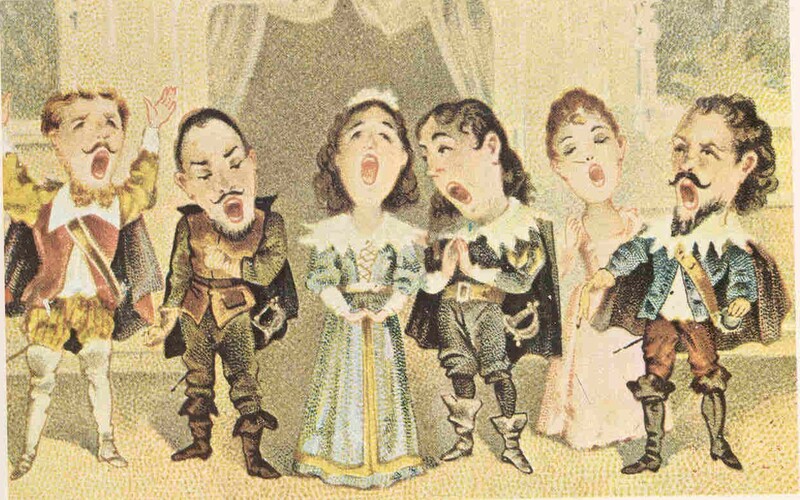 In a typical choir, women have the option of singing soprano or alto and men have the option of singing tenor or bass. Put simply, those with high voices sing soprano (if you’re a woman) or tenor (if you’re a man). Those with lower voices sing alto (if you’re a woman) or bass (if you’re a man). how high is ‘high’ (and how low is ‘low’)? what if the harmony song you’re learning only has three parts? do professional singers have the same range as those in community choirs? what if the harmony song you’re learning has more than four parts? what if you can sing very high and very low? what if you’ve been told you’re a baritone or a contralto? Every individual has their own unique voice and particular range. To some extent we can change things like the quality of our voice or the lowest and highest notes we can sing with practice. But there will always be a physiological limit to what we can do. Plus we all have our own preferences – just because somebody can sing high, doesn’t mean that they want to sing high. Trying to fit a whole bunch of unique human beings into the same system just won’t work. Some singers are lucky and their voices fit perfectly within the prescribed alto range for example. Others might have a voice that straddles two different parts, but doesn’t sit comfortably in either. When somebody comes to singing for the first time, there’s a good chance that their vocal range will be quite limited. They won’t be able to hit the really high or the really low notes. They will be comfortable somewhere in the middle. With time, experience and some vocal training, those ranges will inevitably increase. But in the beginning, it’s best not to try for the extremes. Which is why many community choirs don’t use the whole SATB range in the song arrangements they choose. They might not even use technical terms like alto or tenor (since many choir members won’t understand them), but words like ‘high’ and ‘low’. Your choir might not have many men so you might find one section has a mix of men and women. Many community choirs use just three part arrangements: tops (the high-ish women’s voices), middles (the medium to low women’s voices) and bass (all the men). See also But I can’t sing that high! You may find that you can sing really high, or really low. But you might not enjoy those extremes. Or you might find it a bit of a strain (especially if you sing the extremes for long periods). Or you might find that your voice is somewhat less pleasing at those limits. You need to stick to what is called your tessitura: the range of notes which suit your voice. It’s where your particular type of voice feels most comfortable and shows itself off to its best. That is not necessarily the same as the total range of notes that you are able to sing on a good day, but may be more limited. When you go to your first singing workshop or join a choir for the first time, you may have no idea whether your voice is high, medium or low. To some extent it depends on the kind of group you’re joining, what repertoire they sing, how many parts the arrangements have and even the individual song. If you’ve never sung before, not played with your voice in the shower and never sung along with the radio, you will have no indication of where to go. During the warm up exercises, any decent workshop leader or choral conductor will take the singers through their paces. Some of the exercises will work on vocal range. It’s during those preliminary exercises that you can get an idea of where your voice might lie. Where does it feel most comfortable? Are there notes where you have to strain to reach them? Where is the “sweet spot” that you’re drawn to? You may surprise yourself and have a much lower or much higher voice than you expected! If you find it difficult, even after the warm up, to figure out where your comfortable voice lies (or if you’ve found all the exercises equally easy and can sing very high and very low), then it may be best to head for the middle to start with. For women in a community choir that’s usually the alto section, and for men it will be the bass. Don’t be frightened by these terms: in a community choir the alto and bass parts will (usually) not go really high or really low. If the group is singing songs in three parts, then head for the middle. For those new to singing, it’s a good idea to try different parts out for different songs until you’ve discovered where you’re most comfortable. That’s easiest in a one-off singing workshop as some choral directors don’t encourage singers to move parts. You may have headed for the alto or bass part initially as you weren’t sure where you belonged. But don’t allow this to be a fixed label. It may be that you can sing higher than you think so should move to the soprano or tenor part. In community choirs with few men, the tenor part is often mixed. Arrangements are chosen so the tenor part will suit women with low voices (but not too low), and men with higher, usually baritone voices (but not too high). In that situation, the alto part can become the default part for women who aren’t sure where they belong. Words like ‘high’ and ‘low’ can sound scary at first, so they head for the ‘middle’ part. The danger is that singers can end up staying in the alto section, even though it’s not the best place for their voice. Make sure you re-evaluate from time to time. Age affects our voices too. You might have sung a lot as a young person, but have not sung for many years. Be aware that things change so if you join a choir in later life, don’t stay fixed with an out-of-date image of your voice. It may now be much lower than it used to be. The same thing goes for those who’ve sung in a choir for many years. There may come a time when the part you’re in is no longer suited to your voice. I hope this helps you to find the right part for you. I’d love to hear your own experience of discovering which section you belong to. Do you have any of your own helpful hints?